A 23-year-old woman stabbed outside a a club in London's West End died from a single wound to the heart. Camille Gordon, a hostess from South Norwood, was attacked as she stood in the entrance of the Blue Bunny Club in Archer Street at 1915 GMT on Monday. She stumbled into the club where she works but collapsed. 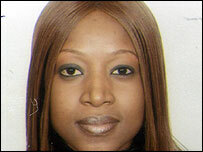 She was pronounced dead at 2025 GMT after being taken to University College Hospital. A post-mortem examination took place on Wednesday at St Pancras mortuary. Scotland Yard said a man had approached Ms Gordon in the doorway of the club at about 1820 GMT and was shown downstairs. It is believed he became involved in a dispute over the payment of his bill about 15 minutes later and then left the club. At about 1910 GMT, Ms Gordon was again sitting in the doorway of the club when a man was seen to enter and assault her. She was stabbed in the chest. The suspect is a black man, aged about 25, seen running down Archer Street, wearing dark coloured clothing, blue jeans, white trainers and a black hat with a white stripe across it. Police are appealing for the man who entered the club at 1820 GMT to come forward as they believe he may have seen something that could help with the investigation. Detective Chief Inspector Richard Freeman, Specialist Crime Directorate, who is leading the investigation, said: "This was an horrific attack on a defenceless young woman and my sympathy goes out to her family. "At this time we are not certain of the motive. It may be that this was the action of a disgruntled customer who visited the club at about 1820 GMT. "I would appeal directly to this individual to contact us so that we may eliminate him from the enquiry at the earliest opportunity". The area was sealed off while forensic officers carried out a search for clues.